Play Miss Red FREE IGT Online Pokies Slots by IGT Here. The game graphics are bright and enjoyable and the reels are full of thematic symbols. One will see flowers, pine cones, squirrels, rabbits, mushrooms, an old lady, wood chopper and a cottage. There are two symbols that will expand on the reels and these are Miss Red and the wolf. There are some basic animations that are used and overall, the game presents a nice display that is easy on the eyes. Since this is a 1024 ways to win pokie, there is a minimum bet of $0.45 per spin, which may be a bit on the high side for low rollers. However, with the many ways to win and the bonus features. The game can be rewarding, so it may be worth the risk to take a few spins. For those with larger budgets the bet amounts can be increased to $90 per spin. The base game jackpot offers a payout of 150x the bet amount. One of the nice features of the game is the Multiway Xtra, which means that winning combination can be created from both sides of the screen. There is also a stellar free spin round and this is triggered with the cottage scatter on reels two, three and four. Players will choose a basket of flowers to see how many spins have been won. If players get more scatters, they can retrigger the feature with a maximum number of 280 free spins. The game also has an End2End expanding feature and this occurs with the wolf or Miss Red on the same row. Any symbols in between will then be changed to match, offering an instant payout. This is one of the more innovative online pokies from IGT and has become an instant hit with punters. Many players are attracted to themed games in which they are familiar with already, Miss Red has drawn a lot of attention in this respect. The game features are well designed and there are some great animations that make the game a pleasure to play. This is one video slot that should not be overlooked as it can provide exciting action and some nice payouts, despite the higher minimum bet amount it has. 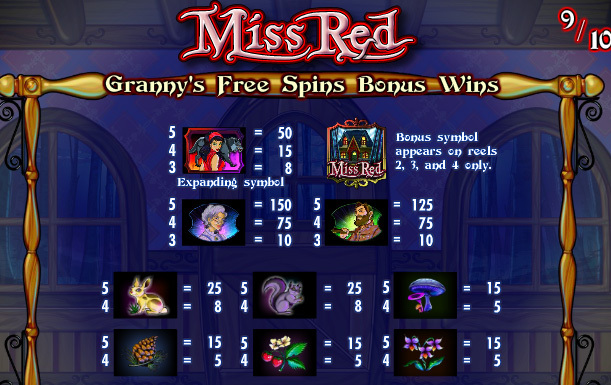 Lucky for punters we have Miss Red to play free on our site as an IGT online slot emulator, have fun!